I have a pretty sizeable cookbook collection but, like most people I imagine, there are definitely quite a few that are gathering dust. Whether it's because they're a specific cuisine, a little bit complex or just not the kind of food that we usually make, the majority only get brought out on special occasions. On the flip side, there are those cookbooks that I am constantly reaching for, week after week, whether it's for a bit of guidance or inspiration, or to draw on an old favourite recipe time and time again. This is a very new addition to my cookbook shelf, but it's been pulled down pretty much every other day since its arrival. Say what you will about Jamie Oliver, but the man knows how to publish a good cookbook. The recipes are simple, tasty and exactly the kind of food that we like to eat at home - which is all I want in an everyday cookbook, really. I've made quite a few recipes from this already, including creamy mustard chicken, banging beef stew and the soft-boiled eggs with home-made flatbreads and mango chutney and have bookmarked tonnes more. My only qualm is that despite all the dishes only containing five ingredients, they don't all make up a meal so you do have to throw some sides in if you want to get your five a day. The book arrived just before Ben did, so I haven't had a chance to explore it properly but when I'm after a little bit of inspiration that orange spine just calls to me. I love Izy's style of cooking, which is big on flavour but little on fuss and every recipe I've ever made of hers has become an instant favourite. Case in point: the 'chorizo' dip (a veggie bean dip that has the delicious smoky flavour of chorizo) and pitta chips are already my go-to if people are coming round for drinks. There's lots of variations on a theme in this book and plenty of ideas for using up leftovers, so it really is a great one if you want to reduce your shopping bill and your food waste. From the moment this dropped onto my desk, I was obsessed. Not only is it a beautiful cookbook, it's full of delicious recipes and the combination of world foods is an unusual and inspiring one. Emma acknowledges the many influences on her home cooking, from the Jewish recipes passed down from her mother to the Algerian ones shared by her mother-in-law. The recipes are bold and full of spice, but simple enough for this home cook to recreate without too much faff. If I'm feeling a little flat about our usual repertoire, this is my first port of call for something that I know both Paul and I, and any guests we may have, are going to love. Our favourites so far are the crispy baked chicken wings, the za'atar crusted halloumi and baharat spiced chicken. This book is basically a warm hug. If you think of your favourite childhood treats then you'll likely find a recipe to recreate them in this delightful cookbook, from home-made jaffa cakes and bourbon biscuits to recreating your very own caterpillar cake. This is a total nostalgia trip and is perfect for this time of year when eating delicious puddings whilst snuggling under a blanket is really the only way to go. My favourites are the boozy puddle puddings, the honeycomb biscuit cake and the roasted cherry & white chocolate brownies - but honestly, if you served me any of the recipes in this book then I would be in heaven. There is something so immensely satisfying about freshly baked bread, but in the past I have found it the most daunting part of baking at home. James Morton's brilliant book changed all of that and now I regularly knock up a loaf to go with dinner. I've mostly stuck with his no-knead white loaf (simply because it's so damn delicious) but have recently started exploring the rest of the book to expand my bread repertoire and I'm very excited to get stuck in. If you've spent any time on the Internet, you've probably heard of Smitten Kitchen. 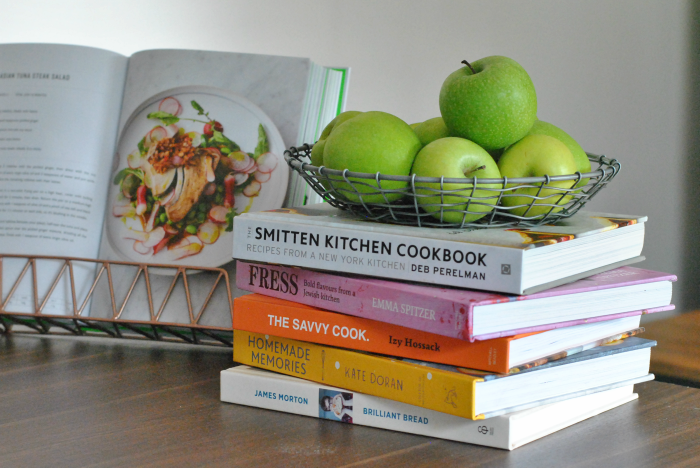 One of the original and best food blogs out there, Smitten Kitchen is an absolute treasure trove of delicious recipes - and the book is just the same but you can splash ingredients on it without fear of ruining your laptop... I'll often turn to this book if I want a recipe I know won't fail - Deb is renowned for being obsessive about getting things just right and it really shows. This book has a little bit of everything, from brunch dishes and salads to sandwiches and cookies. I love the apricot breakfast crumble (crumble? for breakfast? yes, please!) and the peach dumplings with bourbon sauce, as well as all of her dinner party tricks and recipes in the final chapter. I have a real sweet tooth, and a good meal for me is not complete without a treat at the end - preferably a chocolate-based one. It's not my best habit, that's for sure - but life is for living, and denying yourself pudding is definitely no way to live if you ask me. 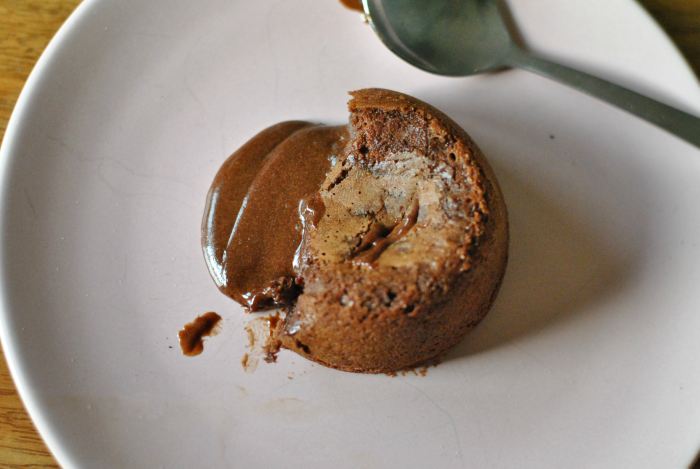 I'll always pick up some Gu puddings when they're on offer, and their melt-in-the-middle chocolate puddings with a drizzle of cream are some of my favourites. So when I stumbled across this recipe in Kate Doran's Homemade Memories when looking for some dessert inspiration, I couldn't resist making my very own version. Hers are made with amaretto, but I having experimented with a few different alcohol options, I actually prefer them without booze at all. Which is not something I usually say, believe me, but I'm such a chocoholic that I don't want anything to detract from the chocolate taste. Basically just give me a big pile of molten chocolate and I'm happy. As always, use the best quality chocolate that you can afford, and enjoy every bite. This is the good stuff.